Do you or your team struggle with rowing equipment and rigging? Are you looking for ways to improve rowing performance and increase speed? 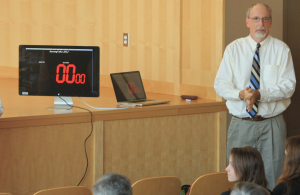 Want an expert speaker to present on a rowing topic, in a way that engages your team or group? 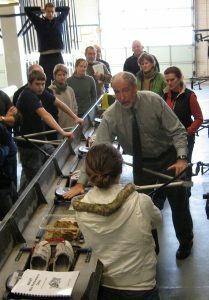 I’m Mike Davenport, and I’m a rowing expert who has been speaking about rigging, rowing equipment, and coaching for over 35 years. Workshops, presentations, and clinics are effective ways to educate and motivate, especially in a sport where you need to move a group toward a common goal. As a recognized authority on rowing, rigging, and coaching rowing teams, I’m ready to show you or your team how to discover and reclaim joy in the sport, improve focus and performance on the water, and reinvent strategies you can use to work effectively with rowing equipment. 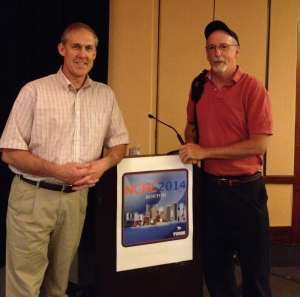 “Wanted to let you know that I attend several conference a year and your presentation has been my favorite! Thank you for sharing and providing a unique way to look at coaching that makes me proud to be a coach. Your presentation made me laugh, cry and overall was inspiring.” -Coach Erin C.
I combine my 30 years as a teacher and 35 years as a coach to create dynamic, enjoyable presentations and events, so that audiences enjoy themselves and organizers shine. My experience includes working at higher-education institutions for over 3 decades and includes positions as head rowing coach and Olympic-team-level coaching experience. Currently, I’m the head rowing coach at the private institution The Gunston School, located in Maryland. I’ve also authored several books, reports, and articles about rowing, coaching, and sports, both on a local and national stage, including several national magazines such as Athletic Management (here and here). My YouTube channel counts over 1/4 million views. I offer prompt, professional replies to your phone calls and email messages. I do even more to make sure the audience feels engaged and energized. I provide a professional, dynamic presentation that focuses on achieving the outcomes you want for your audience. I offer follow-up communication after the event to make sure I met your expectations and so I can get your feedback. I use a simple, straightforward approach (and a good dose of humor) in my presentations, clinics, and workshops, to help rowers, teams, and coaches understand the mysteries and dispel the myths of rowing equipment. … and many more. You name it, I can do it. To discuss having me come speak or present at your location (or any location you prefer), or if you’d like to chat about possible topics and options for your next event, just get in touch here.